It’s the gift-buying season and you’re struggling for gift ideas… Perhaps you’re looking for the best gifts for your boyfriend, girlfriend, mom, dad, or just a friend. Luckily for you, I have gone out and compiled a list of the best tech gifts to buy for 2018. There are so many tech gifts out there, and chances are the hottest electronics are going to be on many people’s wish lists this year, so you can’t go wrong! 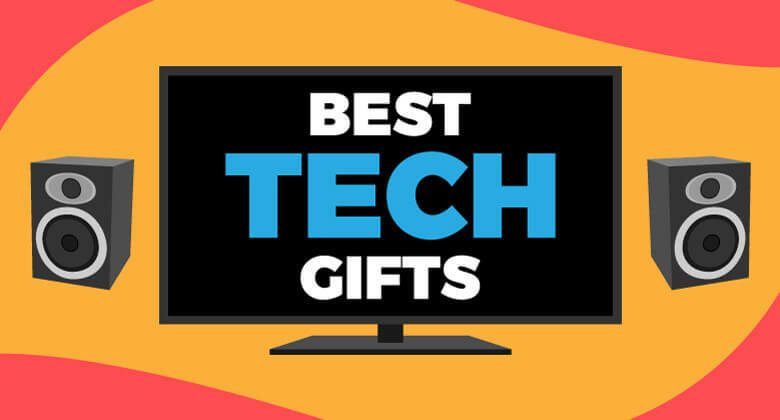 Not to mention, there are some really cool tech gadgets that have come out this year that would make great gifts for anybody. **Note: I have linked to the items on Amazon for your convenience and may make a small commission if items are purchased, but it doesn’t affect you in any way (you can read more about Amazon affiliate links in my Disclosure Policy). Some of the most anticipated games of last year were released near the end of 2017 including Super Mario Odyssey, Call of Duty: WWII, Splatoon 2, and Wolfenstein II: The New Colossus which would be great games to buy for 2018. In fact, Super Mario Odyssey for the Nintendo Switch is one of the best rated games of the year, and considered one of the top Mario games ever released. Other hot video game titles released last year in 2017 were Destiny 2, Assassin’s Creed: Origins, Resident Evil 7: Biohazard, Arms, Uncharted: The Lost Legacy, and many more. These games are on top of many people’s holiday wish lists this year and would make great gifts for men and women gamers alike. In order to play these games, however, they’re going to need a gaming console if they don’t already have one! The three hottest gaming consoles on the market right now are the Nintendo Switch, the PlayStation 4 (PS4), and the Xbox One S. Also, one of the most requested gaming consoles of the year is the Super NES Classic which is a miniature version of the old Super Nintendo system! It’s extremely fun to play on and brings back good memories. Make sure that if you are purchasing video games as gifts that you are purchasing them for the correct gaming console! Want to game in 4K? If you have a 4K TV and want to do your gaming in 4K, check out the Xbox One X or the PlayStation 4 Pro! It’s the most beautiful gaming you can do today. Although fitness trackers have been around for some time now, they continue to gain popularity through 2018. Many companies have gotten their feet wet in the fitness tracking industry and have released wearable bands for you to track how many steps you take in a day, your heart rate, how many stairs you’ve climbed, how many calories you’ve burned, etc. I would say the best fitness trackers today are made by Fitbit. I have owned three different models of Fitbits, and have loved them so far. A fitness tracker is near the top of the list as one of the best tech gifts for 2018 for anyone on your shopping list. Whether someone is trying to lose weight or not, they’re a great gadget to have to help you better track the exercise you are getting in a day. On top of that, many of the fitness trackers come with other very helpful features. These include sleep tracking, call/text notifications, a heart rate monitor, and more. Buying Recommendation: If you are going to buy a Fitbit, you’ll have to decide which one you are going to get. The Fitbit Charge 2 is the most popular by far, and is the one I currently own (and recommend!). It is the best fitness tracker for the money. The next most popular Fitbit is the Fitbit Alta HR which is a skinnier version of the Fitbit Charge 2. Lastly, if you are on a budget, the Fitbit Flex 2 would be your best choice. Speakers are obviously nothing new, but smart speakers are really gaining traction. Some notable smart speakers were released last year in 2017 that would make good tech gifts for anyone. There are many smart speakers to choose from including the Amazon Echo, Google Home, Microsoft Invoke, Apple HomePod, and the Sonos One. The smart speaker I want to focus on in this post is the Amazon Echo. Smart speakers give you the ability to play music, ask questions, make calls, start Netflix, change the temperature of your house, turn on or off lights (with smart bulbs), and many more things all through the power of your voice. They are a great, inexpensive way to make your home smarter. The best part? If you have multiple smart speakers in different rooms of your house, you can have jazz music playing in one room, rock playing in another room, and rap playing in the basement (party!). Or, if you wish, you can have the same song play throughout the whole house! And that’s just one of thousands of things you can do with smart speakers. Buying Recommendation: Amazon has a number of Echos to choose from: Amazon Echo (mentioned above), Echo Dot (smaller and cheaper), Echo Spot, and the fancy Echo Show. I would recommend buying the Amazon Echo as it is the best all-around smart speaker for the money. Get your hands on one – you won’t be disappointed! Streaming devices are becoming more and more common in households these days, and for good reason. They are the best (and cheapest!) way to stream your favorite content (like Netflix) to your TV. Don’t have a smart TV? No worries! You can turn any TV into a smart TV by using devices like an Amazon Fire TV Stick or a Roku Express. Even if you have a smart TV already, many of the programs that run on smart TVs are slow and clunky. Buying a streaming device can help speed that up and give you much a much better streaming experience! Want to stream in 4K? If you have a 4K TV and want to stream in 4K, check out the beefier Amazon Fire TV, Roku Premiere, or the extremely powerful NVIDIA Shield TV. Don’t have cable? Do not fear! You can watch live TV with a subscription to Hulu, Sling TV, PlayStation Vue, DirecTV NOW, and others right on your media device! Want an even better experience? Pair an Amazon Fire TV Stick with an Amazon Echo and tell your TV to do things all through your voice – no remote needed! Want to watch Netflix? Say “Alexa, open Netflix.” Other commands work as well such as pause, stop, play, and many more. You may have noticed that more and more UFOs drones are taking to the skies recently. Drones (although pricey) are extremely fun tech gadgets to play around with. They can be used to record high definition video or take pictures from views you could only dream about unless you were a bird. Even if you’re not recording something or taking pictures, they can be fun to fly around just like any other remote-controlled gadget! Be careful, though. Drones are restricted in certain areas and sometimes require a license in order to legally fly one (for example, if you’re near an airport). Buying Recommendation: If you’re a hobbyist on a budget (around $50) looking to fly a drone for fun, check out the Syma X5C Drone. However, if you’re hoping to use a drone to take high quality pictures or record high definition video (up to 4K in some cases), prepare to spend anywhere from $500-$2000. Pricey, but they’re worth it if you’re looking to get those breath-taking shots. The best drone for shooting professional video and photos on the market right now is the DJI Mavic Pro which you can get for under $1000. There are much more expensive ones, but for the money, this is the best drone you can buy right now. There you have it! The 5 best tech gifts to buy for 2018. If you are looking for a cool tech gadget to buy someone, you can’t go wrong with one of the items in this list! How about you? What tech gadgets are missing? Which ones would make your top list? Let me know in the comments!